In the State of Uttrakhand, India there are many places to visit. Daksheswara Mahadev Temple is one of them. This temple is located in the town of Kankhal. Kankhal is 4 km from Haridwar. It is a Hindu temple. This temple is dedicated to Lord Shiva. This temple was named after the Daksha Prajapatis who was the father of Sati. This temple is one of the most famous and visited temples of ancient temples of India. The temple was built was Queen Dankor in year 1810 AD and was reconstructed in year 1962. On Shivratri, special sacred ceremonies are performed by devotees at the temple, as the auspicious day is said to be the marriage day of Lord Shiva. Many number of devotees come in the month of Saavan and Shivaratri in this temple. As per Hindu mythology, father of Sati, King Daksha Prajapati’s name is given to the temple. Out of the fourteen Prajapati’s, King Daksha was one of the creator idols who had control over procreation and who was termed as the guardian of life. As per Hindu sacred book and Mahabharata, King Daksha Prajapati had performed Yagna (a ritual submission of prayers by performing Vedic mantras and presenting herbal preparations in the holy fire) in which he did not invite Lord Shiva (Sati’s husband). So She jumped into the fire of the yagna and died. Her death made Lord Shiva very angry and He sent his demi-god Veerbhadra, Bhadrakali and the ganas to Kankhal for the war. In the war, Veerbhadra cut the head of King Daksha. All the deities requested Lord Shiva to forgive king Daksha and then the Lord Shiva restored his life but implanted the head of a goat on his body. Later on King Daksha realised his mistakes and apologised to Lord Shiva. The timing of the temple is 7:00 AM to 7:00 PM in all days of week. The Best time to visit in this temple is from May to October but devotees can also come in any month. By Air : Jolly Grant Airport is the nearest airport. It is located in the Dehradun. By Rail : Haridwar Railway Station is the nearest railway station. Haridwar is well connected to all major cities. 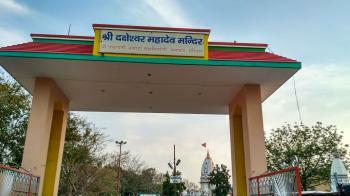 By Road: Daksheswara Mahadev Temple is 35 kms away from Rishikesh and 5 kms away from Haridwar station. A rickshaw can be hired to reach to the temple and move around and visit nearby attractions.